Delphi says its solution can boost fuel economy by up to 19 percent. Delphi is pitching automakers on a fuel-saving technology that it reckons could solve a brewing crisis for European manufacturers' diesel-heavy product portfolios. The powertrain and electronics giant believes combining two emerging technologies can boost the efficiency of traditional gasoline-engine vehicles by as much as 19 percent. If so, the solution could help some automakers disentangle themselves from relying on diesel engines to meet global fuel economy regulations. Some European automakers have banked on diesels to meet environmental standards because they offer better fuel efficiency than gasoline engines. But diesel engines are now in doubt because of tightening global CO2 standards. Delphi officials say they can make gasoline engines hit comparable numbers while still preserving the low-end torque that diesel drivers are accustomed to. Delphi's proposal combines its 48-volt mild hybrid system with a new type of cylinder deactivation it calls Dynamic Skip Fire. When paired, the technologies can increase fuel economy by as much as 19 percent on the EPA's city cycle test and 14 percent on the highway, said Harry Husted, Delphi's director of powertrain engineering. Both systems are ready for production, Delphi says, though neither is likely to arrive before 2020. The 48-volt system and Dynamic Skip Fire can be used separately but complement each other by increasing engine efficiency at both low and high speeds. Delphi proposes combining Dynamic Skip Fire with the 48-volt mild hybrid. AutoPacific analyst Dave Sullivan says the combination could offer a credible alternative to diesel engines. 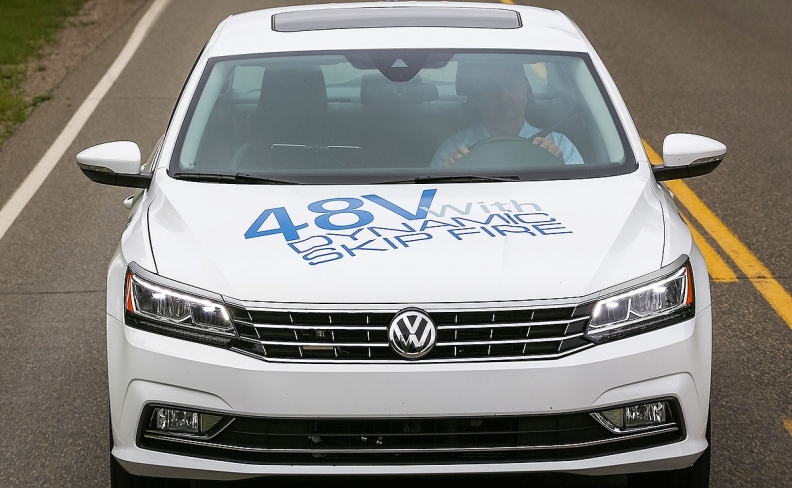 "The 48-volt mild hybrid system does not yield much benefit on the EPA test cycle," Sullivan said, "but combining these two technologies sounds like the methadone Europe needs to get off its diesel addiction." General Motors is likely to embrace one of the two systems when it introduces the next-generation Chevrolet Silverado and GMC Sierra late next year with Dynamic Skip Fire, Sullivan forecasts. It would replace GM's current cylinder deactivation system, which boosts fuel efficiency by cutting off four cylinders of a V-8 engine and two cylinders of a V-6 when not needed. GM and Delphi have invested in Tula Technology, the Silicon Valley firm that developed the software that operates Dynamic Skip Fire. Delphi makes the engine parts for the system. But the technology would be more critical in Europe and China, where Delphi is now focusing its marketing efforts. In many European countries, diesel vehicles account for nearly half of new-car sales. But diesel's future is in doubt because of tightening emissions rules, expensive after-treatment systems and the Volkswagen emissions-cheating scandal. China is also cracking down on vehicle emissions. While automakers are amping up development of battery-powered electric vehicles, Delphi, citing data from consulting firm IHS Markit, believes electric vehicles will phase in over a long period and not immediately replace the internal combustion engine. The technology decisions will come down to cost considerations, said Mary Gustanski, Delphi's vice president of engineering. "You can spend $2,000 for the diesel system, with the appropriate after-treatment, or you can spend $1,500 and you can have a 48-volt mild hybrid with Dynamic Skip Fire," Gustanski said. "When you do that, your CO2 performance is about equal, but you get enhanced performance," she said, comparing the new approach to diesel. Delphi says Dynamic Skip Fire will cost an automaker about $350 per vehicle to install. But they would additionally have to modify an engine's oil passages to use the system, as well as create room for a solenoid for each cylinder. That could entail a complete redesign of the cylinder head.